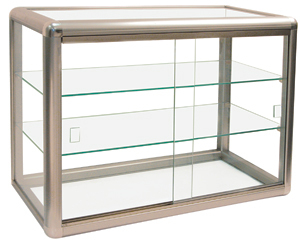 Change your countertop space into an exciting effective merchandising opportunity. 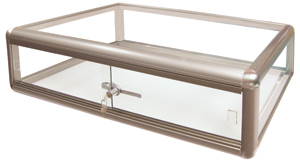 Countertop showcases are great for displaying jewelry, giftware, electronics, cameras, cell phones and more. 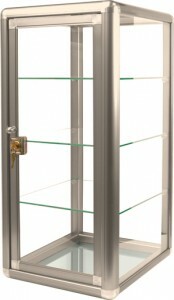 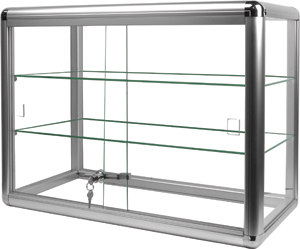 For retailers that do not have enough space for a showcase, but would like to present an upscale image, these aluminum tempered glass countertop showcases with sliding glass doors, key-lock and radius edge aluminum frames are a great solution. These cases are also great for trade shows and are available in 3 different sizes and 2 different colors.